Start off by detangling your hair. If you have dark locks, dampen with water to help absorb the pigment of the pastel. Blonde hair tends to show the colours up beautifully but it’s harder to get a nice strong pigment on dark hair. Blondies, you can still dampen your hair if you wish but if you don’t fancy prolonging the colour, skip this step. Again, another optional one for the blondes and essential for the brunettes, colour your hair with a white pastel to create a nice blank canvas. Now take your soft pastel in the pigment of your choice and start colouring sections of your hair. Twisting your hair as you do this will help you to achieve a deeper, stronger colour. Now gently comb out the chalky residue and any tangles. Now you need to lock the colour into your hair by running over it with a straightener or curler. To get the colour out later, a good shampoo should do the trick but do remember it will last longer if you have blonde hair and you dampened it before chalking. Voila! 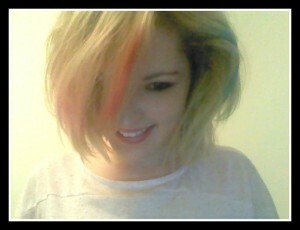 People will think you’ve spent ages dip-dying your hair. The pastels only cost a few pounds from good craft suppliers. Mine were from The Works at around £2.50 – not bad for the hours of fun you can have with them. You can add an ombre look to your hair by dip-dying the ends; rock the wild rainbow look like Nicki Minaj did recently; or just go for a few random pretty peach streaks – hello gorgeous! For more beauty musings you can check out Laura’s blog and vlogs here or follow her on Twitter. She’s very sweet and pretty, I do recommend it.